Watch out For Locksmith Scams! Beware of Bad Actors & Con Artists! There are a lot of ads on the internet. Some of them can lead you to a scam. 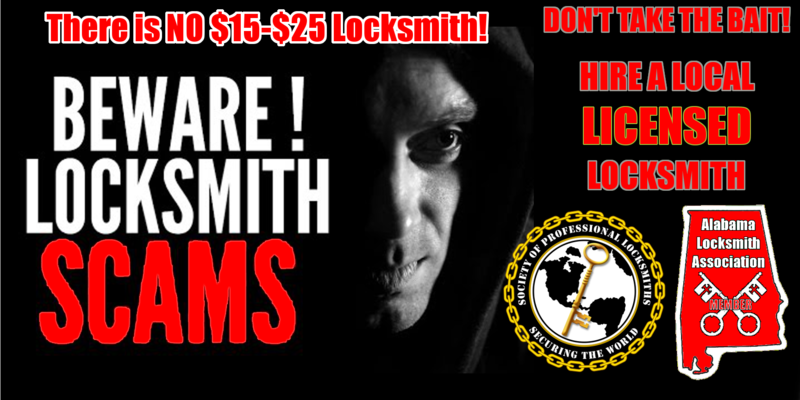 Many companies advertise suspiciously low prices for “Locksmith Service” $19, $15, even $9.99 to have a locksmith come out. But that’s where the good deal turns sour. The technician arrives and you find out the truth behind the sales pitch. You agreed to have a locksmith come to your location for $19. Now he’s here, now you owe $19, but you wanted him to unlock your car, that will be $50 for “labor” – What? Nearly 70 bucks for a “$19 Locksmith”. With Unlock it For Me, you receive a total cost quote over the phone, that does not increase once we arrive. WHEN HIRING A LOCKSMITH IN ALABAMA THERE ARE THREE SIMPLE SAFETY TIPS TO KEEP IN MIND. Home protection means feeling safe and secure from the start. The Alabama Electronic Security Board of Licensure (AESBL) is the state agency that works to protect all Alabamians by licensing locksmiths, and home security companies and locksmiths in our state. 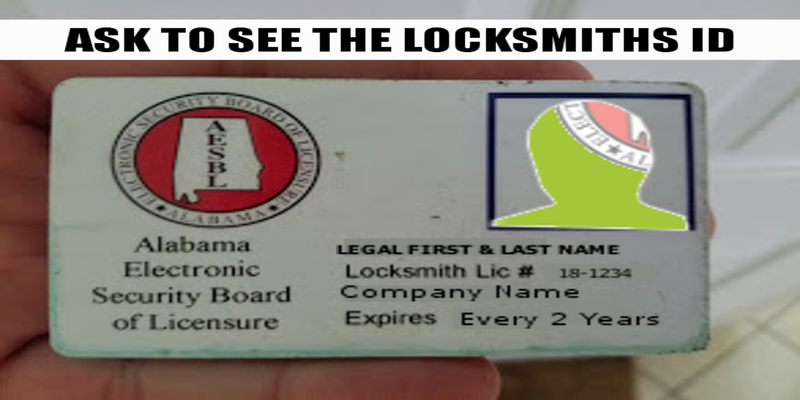 Always ask the locksmith or security representative or to display proof of Alabama licensure. WHAT IF THE COMPANY OR INDIVIDUAL REFUSES TO SHOW A LICENSE? If they can’t or won’t show you a license, call the police to report unlicensed locksmiths soliciting and operating in your area. Before you hire a new provider. Before you call. Look them up! – by name of business OR by zip code. WHAT IF THE COMPANY IS UNLICENSED? Especially if they come knocking door-to-door. Any individual representing any company may encourage you to sign a contract "on the spot", to take advantage of a “limited time offer”. Additionally, an installer crew may be “already in the neighborhood”. Beware of offers that seem overly opportunistic in the sellers' favor, or in general just seem too good to be true. They often are. As a consumer, you should never, EVER, feel pressured to sign anything. You are well within your rights to ask them to leave their marketing literature or materials with you. Inform the representative that if you’re interested, you’ll call them at a later time. A provider cannot refuse to leave your home when asked. The locksmith gave her a quote over the phone of $40 but when he arrived he charged her $140. Consumers who are locked out of their homes or cars can be at the mercy of unethical locksmiths who quote one price over the phone, then increase the price considerably once they arrive. These tactics have been typically reported about locksmith businesses that claim to be nearby, but are actually located miles – or even states – away. I was in a hurry. I was tired. It was cold outside. I just wanted to go get in bed. I was actually shocked when they told me it’d be $120 versus $50. Look for identification. Legit locksmiths will show up in a marked vehicle and provide ID. Get an invoice. If you have to dispute any work later, you will have proof of what was done. Include parts, labor, mileage, service charges, as well as the business name and address. Always inquire about insurance. If anything is ruined during the repair, their insurance will cover losses. Pay with a credit card. It is going to be your best option, as most cards have built-in fraud protection. Verifying you are dealing with a licensed Alabama locksmith ensures you are dealing with a company or individual who has been background checked and verified to have liability insurance. All licensed locksmiths in Alabama have been background checked by ALEA and the State Beaurau of Investigation. What’s the best way to pick a reputable locksmith? Consider researching locksmiths before you need one, the same way you would a plumber, electrician, or other professional. That works well if you’re looking to have some security work done at your home, like installing deadbolts on the exterior doors of your house, or a safe in your bedroom. But if you’re dealing with an emergency, like being locked out of your car, you really don’t have much time for thorough research. Regardless of whether you are locked out of your car or home, you need new locks installed, or you require other security work, the FTC offers these tips to help you hire a legitimate, local locksmith. Calm Down. You made bad decisions when you are emotional. If the price the locksmith provides when he arrives doesn’t jibe with the estimate you got on the telephone, do not allow the work to be done. UnlockItForMe is based right here in Alabama. When you call us, you get a professional, local locksmith. No national call centers or crazy price schemes. Give us A Call Today. At Unlock it For Me we are dedicated to excellent customer service. Even if you are not a customer we want you to be protected from scams, fly-by-night “professionals” and other uncomfortable situations. We are not one of those companies. We DO NOT Operate like this. You are quoted a low, flat rate that will never go up on site. If you find a locksmith in the phone book, on the Internet, or through directory assistance, and a business address is given, confirm that the address belongs to that locksmith. Some disreputable companies list street addresses to give the impression that they’re local. But the addresses may belong to other businesses or vacant lots, if they exist at all. You can verify addresses through websites that allow you to match phone numbers with street addresses. Some legitimate locksmith companies may not include a street address in their listing either because they operate a “mobile” business or they operate their business out of their home and may be reluctant to list that address. If you call a locksmith who doesn’t list an address, ask why. If the answer is that it’s a “mobile” business, you will understand they have no storefront.